When the Blue Stars made the world-famous Tour de France cycle race their show theme for 2008, visual opportunities abounded. Bicycle helmets and jerseys for the color guard costumes, bike handles attached to flag poles and wheels to spin and throw, and a stunning finish to the "race" with a winner's podium. But there's one part of Tour de France lore drum corps fans probably won't notice is missing from the Blue Stars' production, and perhaps it would be the most fitting addition to symbolize their 2008 season: the polka dot jersey. It would be an unlikely addition in any capacity, but one that's appropriate as the founding member corps of Drum Corps International climbs back to the top. In the Tour de France, the polka dot jersey (maillot à pois rouges in French) is awarded to the racer dubbed the "King of the Mountains," the fastest ascender in the race's mountain stages. The Blue Stars have been climbing competitive mountains for more than two decades now, and this season look to return to the World Championship Finals for the first time since 1979. Blue Stars member Reuben Tobar, one of several Californians in the corps, followed instructor Michael Shapiro from the Corona Winter Guard to the Blue Stars. Tobar said, "This season has been awesome. It's been a battle, but we keep on getting better. We're striving for the best and always working hard. We want it not to be a new Blue Stars, but a better Blue Stars. It's exciting being a part of this organization and watching it grow." Speaking to members of the corps such as Tobar highlights a wide recruiting network the Blue Stars have, from winter guard programs to high school instructors, to recommendations from other corps of members whose talents might be of use. Angie Vargas, another Californian and a "rook-out," also marched under Shapiro's tutelage. She said, "It's been one big, new experience. I have never experienced drum corps before, and it's definitely much different than winter guard. This is what our life has become, and it's really exciting working and living with all these people for two and a half months." Vargas said, "I knew it would be hard, but I didn't think it would be this hard. But it's definitely made me a stronger person. It helps build character, and it's definitely made me look at things differently. When you think you're about to give up and you keep striving, that just makes you better." And how about the competition? Vargas remarked, "I feel like we're the underdogs, and we're definitely taking everybody by surprise." 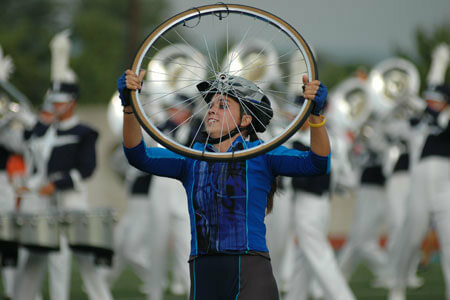 "This season has been amazing," agreed Joe Hathaway of Columbia, Mo., who is in his rookie season with the Blue Stars. "We've surprised a lot of people, and we're going to keep rising." Veteran corps members might have a better perspective on where the corps has come over the last few years, but are nonetheless excited about this season. "It's been rough," said Troy Jones, a four-year veteran of the Blue Stars from Bloomington, Ind. "Last year we were fighting to make the top 12 – that last spot into the [World Championship] Finals. Our mindset has been a lot different, and we've been a lot more focused on performing our show." The corps has been very competitive with its programs in the past, first as the silver medalist at the DCI Championship in 1972 and the bronze medalist in 1973. The Blue Stars shifted divisions in the 1980s and over the next decade and a half collected 13 medals in Division III and one in Division II, including 4 first-place finishes in the Division III Finals. In 2006, the corps returned to the World Class (then Division I). In 2006 and 2007 the Blue Stars knocked on the door of the elusive 12th spot in the World Championship Finals, but placed 14th each time. Now, having bested several corps throughout this season the Blue Stars look to return to the Finals for the first time since 1979. "This [success] is a real special thing for a lot of the people in the corps, and I'm really glad that I was able to get on board and be a part of this special season," said Michael Post. 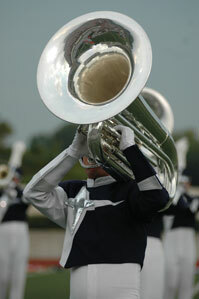 A tuba player, Post had his first experience with the Blue Stars during a weekend rehearsal camp this past March. He and his friend, a fellow student at Arkansas Tech and also a conductor for the corps, drove for a full day through a blizzard to reach Indianapolis for the weekend. Post smiled about the ordeal, saying, "It was a pretty grueling weekend, but I stuck with it and here I am now. I'm loving it." Snowstorms haven't hampered the corps since, but Post reported it was still a challenge to march with the rising Stars. "What I've learned this season is how to overcome physical and mental barriers. That's what drum corps is, it sets you up. You're going to work hard, you know you're going to work hard, but the thing is, you can push through it. So many guys have done this, your friends are doing it standing next to you, and you want to do it to. It's a mental thing; if you can break through that mental barrier your body will go with you." What does it mean to be a member of the Blue Stars this season? Many things, according to Jose Rodriguez, a tuba player in his second year with the corps. Rodriguez said, "It means family, responsibility, and greatness all around. It's about being around people that I care for and who care for me. It's about being on the field performing with them and knowing that we're all trying to achieve one goal – that's to be the best that we can be." "I would say it's perpetual hard work," said Melanie Kesler, a rookie member of the color guard. "Every day it gets harder and harder and we have a lot of excellent people working with us. We have Kevin Ford, who's our drill writer, and he came on tour and he expects nothing but excellence. It's kind of hard to slack off and not be at 100 percent when you're in the heat and everybody around you is giving more and more effort than you are. You just have got to keep on building, and we we feed off of each other getting better every day, and that's not a lie." Kesler has found great fulfillment while being pushed to excel. She said, "I wanted to be a part of something great when I came out here to audition. I feel like I'm achieving that more and more every show. I'm the best I ever have been and I learn new things every day, especially from all of the people around me." 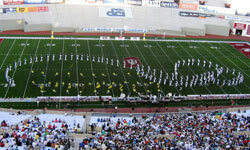 Will the Blue Stars make it to the final stage of the 2008 Summer Tour? Only time will tell, but it's clear that the members are set on continuing their climb. Fans should continue to expect the unexpected from the Blue Stars … though you can probably rule out polka-dots. Video by Corey Davis.